Traditional folders allow you to organize 8-1/2 x 11 size documents within two pockets, but what if you need more space? Look no further than the 3-Pocket Poly Portfolio. Ideal for classroom and office settings, this three-pocket folder is an essential presentation and letter-size document storage item. 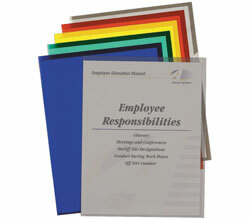 Made from heavyweight polypropylene material, the portfolio is the same size as a two-pocket folder when folded up. Simply pull back the front flap and the inside flap to expose all three, top-loading pockets. There is a business card holder located on the middle pocket, making it possible to personalize client presentations or class reports. Blue. 1/EA.